If you received this application it means you may be selected to appear on “Illest Road Trip of All-Time.” IRT is a new show where groups of people get $10,000 for a road trip that will be a “unique, life-changing, and eminently watchable experience”. The money you spend will mainly go towards two things your vehicle (rental and gas), and your daily expenses (Hotel and Food). Plan carefully, groups who do not plan to spend at least $9500 of the money will not be considered. These are the first four lines of a Road Trip project that I have been using with kids for the past few years. This project is a good companion to a linear equations unit that could provide a rich context to help students think about using these equations to solve a real world problem, instead of just a “problem”. I have taught it for a bunch of years and it has been kind of popular among choices for students portfolios so I thought it might be good to have it online somewhere in case someone wants to try it out. That said it is still a work in progress and I would appreciate it if any readers could give any kind of feedback that would be good. Here is a link to the full project, but I’ll walk through it below. Let me know what you think! Picking your travelers and choosing food and lodging. The first 2 pages of the project asks kids to pick who they want to travel with. Since MTV can pull strings, their lists can include celebrities as well as their classmates and family. Students can pick anywhere between 1 and 8 people. This project is designed to have a lot of choice throughout so no two students have the same numbers. Next they think about what kind of food they want to eat and what kind of hotel they want to live in, and the luggage. When students decide how much to spend on their food, lodging, and baggage, they have to think in terms with variables since they don’t yet know how many days they need to spend on their trip. Some students will make up a day that they think they are travelling and skip writing an the equation in order to just write down the number. This is a great to transition to thinking about variables by simply substituting the value they used for their days with ‘x’ or even the word ‘days’. Students may also calculate their total costs differently and it may good to ask people whether or not someone who wrote 100x + 400x + 300 will have the same cost as someone who wrote 300 + 500x and why someone might prefer one form over the other. Next I have kids get on a computer and look up the different places they want to go on their trip. Much to their surprise, and mine to be honest, we don’t use google for this. Google just didn’t have better road directions in Mexico and some of Central America, so we use bing maps. Finding the miles and hours on the computer can be engaging, but could end up being a pretty empty without anything else for students to think about. I added a couple of other questions that would make sense to think about in the context. If MTV only allows people to drive at maximium 10 Hours each day. What is the smallest number of days you could spend driving? If your trip ends up being 31 days, and you spread the driving out over each day, how many hours would you spend driving each day? As a native Detroiter, I had the most fun thinking about the cars for this trip, and I think the kids have the most fun picking their cars as well. Each car has a rental rate and the fuel efficiency. Get ready to do a little explanation of what Miles Per Gallon means by the way. In New York City, where some of my seniors and a few co-workers might never have a drivers license, this may be the first time they hear about City/Highway mileage. Once they get the miles per gallon, and the number of miles of the trip from the previous component, they should be able to find the total amount of money they will spend on gas during their trip. My worksheet may make it to easy for kids to understand the process, so this is a good place to edit the sheet if you want kids to do more reasoning around rates. Students can make a y=mx + b by combining the daily rate for renting a car with the total cost of the gas. At this point the kids have two equations, for their vehicle and their food and lodging, and they have to find the trip with the right amount of days for a total costs between $9,500 and $10,000. This day looks like lots of calculating. 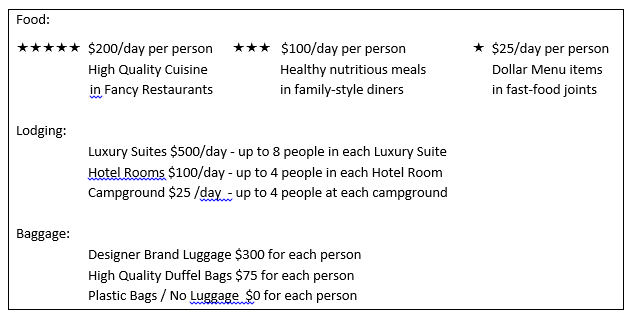 I ask kids to use tables in a sort of guess and check approach, where they first find the cost of a trip for 7, 14, 21, and 28 days, and then narrow in on a range of days that should get them the total costs that they want. There is certainly more graceful ways that they could approach the problem, but I really want students to see how linear equations can be used to model a real situation. The other thing I’m kind of mean about is that when a student doesn’t get their numbers to work out, they have to go back and change something in their trip in order to make it work. They rarely have any problem with it, and after I suggest the things that they alter in order to make it work, they get pretty engaged in seeing how their story will end. The next part of the project is not really necessary, but this maybe for you. Do you like having kids find equations from tables or pairs of points? What about solving systems of equations? Or do you have a hankering for some piece wise functions? Well having students analyze these sponsorship pay cycles may be for you! In this situation the kids are going to choose which of these companies are going to pay them for completing the trip, and each company could the best for a different student in the class. The question of at what point someone should choose Pepsi over Coca-Cola leads one naturally to talk about the solution to the system of equations or the intersection of the two lines. If one were so inclined, they could even look at the feasible lines from each of the companies and create a piece-wise equation. So that is pretty much the whole project, so check it out and let me know what you think. This could be used as a whole packet kind of thing, but I’ve had a lot of success breaking it up into parts and having kids do it at the end of class throughout the unit, and you can use most of the parts in whatever order makes sense. But seriously, if you’ve read this whole thing, and you have any ideas that you think would help me make better projects, I would really appreciate any feedback you could give me. It would really help, and all you have to do is leave a comment below. Thanks again! The last page of the rubric is helpful to give to students who struggle to write the cover letter. I usually tell them to just write a paragraph for each line of the cover letter and that helps them get started. Students who have written thorough explanations throughout the project will typically have the easiest time with the cover letter, so definitely encourage students to write about their process as they go along. I am really glad this is still helpful to people! This is great stuff. As someone who makes all his assignments, I know how hard it can be to format everything and I’m impressed by the look and the organization of the project. I’m going to try to assign this as a way to make up homework for students later in the semester, just to see how it goes. I know my students will be confused with some of the notation and style as they will be used to the way I write problems and my obsession with writing everything in function notation. But overall, I think the instructions are clear enough that students can work on their own (these are second year Algebra students) with a little after-school help from me and/or their peers. I will definitely give you some feedback afterwards. I think I already told you that I was brainstorming a road trip project. My project was less about money and more about position. I teach a lot of position function stuff because of how often the students will see position, velocity, acceleration functions in Calculus. So the focus of my project would be to model their approximate position, relative to Los Angeles, at any given time. The more places they wanted to go/stop, the more pieces of function they would need. If they wanted to go to Portland and stop in SF, they could basically draw a line with slope 70 for six hours, then a line of slope 0 for 2 days, then a line of slope 65 for 10 hours, etc. I’ve found piece-wise linear functions to be a great motivator when it comes to teaching point-slope form of a line. I’m wondering if a position-tracking function might be something you would consider in a later unit, revisiting their original project and seeing how there are more linear functions relating to this scenario. Last year I did a problem about a trip I had taken where we answered questions about my trip based on mathematical evidence (mostly constant rates of change). I was shocked by how little my students knew about the world outside of Downtown LA. They had trouble identifying surrounding states, using google maps, and making sense of distances. It was very eye-opening to me and made me feel like I needed to do more work like this. Common once said, “I asked my man how traveling the world sound, found it hard to imagine he hadn’t been past downtown.” I’m curious if you had the same experience when you’ve given this project. These are crucial understandings that no one seems to be giving them. I’m going to try this out as a culminating project in my Algebra 2 class. We start the year with a review of Linear Functions and this seems like a perfect project. If it goes well, I’ll use it again for my Algebra 1 classes later in the year. I changed some things around – I’m going to use the Sponsorship part as motivation to move into Systems and then give them parts 5/6 some time in the middle of the Systems Unit. Last year I tried something similar but focused more on the physical appearance on a map: travelling from Philadelphia to Los Angeles, what was the slope of the line (looking at miles as units), we talked about distance and midpoint through that as well. It was fine, but I like yours much better. Thanks for sharing! Thanks Mike. I hope you post up what you do with it somewhere. I’ve used this project for 3 different classes now. The kids definitely get a little overwhelmed about the length of it, but once they get over that they are so excited! All the little choices that get to make (lodging, food, car) they LOVE! I would hear a pair (boy and girl) arguing about sleeping at a camp grounds. She would never and he just had to! It gave them a good outlet to have fun in the project, and not just work. In my 52 minute classes, I found the kids needed 4 days for. It felt extreme to me, but in order to make it a partner activity, and totally in class, it was a 4 day project. We loved this project! I highly recommend it to any teacher! This looks so interesting! I would love to use this for my current linear equations lesson. We previously finished with a Geocaching project connecting the use of radicals, distance and then now linear equations. I’m excited! thank you for sharing. I loved this assignment, and my kids loved it more. I’m not exaggerating when I say that it turned my entire algebra class around. We had approached linear equations in probably five ways, and none of it was making sense to the students. This project created a lot of “aha!” moments and made them all feel better about how algebra is relevant to the real world and fun. Even after moving on, the class has kept the confidence and momentum up and we are all having much more fun and doing much more math. Thanks for sharing it! My kids are doing this project right now and they are having such a blast with it. is there a way to maybe see some examples of student work to show them some examples? i will love to try this out…i have never tried out a real lifev situation equation…. I’m going to try this out with my grade 9 math class this year! Thank you for sharing this! I love the idea! I am going to try this with my 8th grade class. Thanks for sharing! I’m curious how you graded this: was it based on what they filled in or was the paper they wrote part of their grade as well? This is definitely something I want to include with my Algebra 1 students this year. Wow! Thanks for putting this out there! I plan on trying this with my Algebra 1 class and can’t wait to see what they think. They are a highly energetic bunch, so I think this will hold their interest! Thanks again for such a thorough description. I used this with my 9-12 grade math class with at-risk students–super engaging! I had to do a little additional scaffolding to support/supplement their math knowledge, but that was easy to do with such clear lessons! I love all the math students were using/demonstrating, as well as everything they learned from researching where they wanted to travel. The wrap up was that each had to present his/her trip to the class (graphs, intro video of why they were the best to take the trip, etc) and try to convince the rest of the group (and a few adults) that they should be voted at the winner. It was a nice way to increase the authenticy and buy-in. Thanks for a great project! I love this–thank you so much for sharing. I was looking at making something similar to this and was happy to find it already existed on the interwebs! You’ve clearly put a lot of time into putting this all together. Thank you for sharing with the math community so lovingly! Thank you!! I am wondering if you have a rubric for this project? Hi! I’m a bit confused about the “sponsorship” scales. Does it mean that for a 16 day trip, for example, Coca Cola will pay 15 days of the daily rate of the 15 day pay scale, plus 1 day of the 20 day day pay scale? Or does it mean that they will pay 16 days pro-rata of the 20 day day scale? Also, where does it state that a fixed amount (b) will be paid? Any clarification would be great! Thanks! Carl – love it! Thanks for sharing, I will be using this with my Integrated 1 8th graders next year (we already finished linear equations) or maybe as an end of year culminating project. Wondering if you assigned point values to each part and graded the individual papers, or used a rubric? 42. The answer for all the questions is the number 42. That’s up to the students, the answers depend on what they choose. Every kids project should be different. This mini project is a good idea! My only question is if students do not reside in NYC how are they affording to get there? Will that cost be covered by MTV or once selected would they need to be able to afford to arrange their own transportation to NY? I know this is a question the students will ask. Another piece that may be added is that they plan to to create a “Go Fund Me” page so they may fund raise to come up with the money needed to travel to NY to participate in the road trip. Thank you for sharing! I would definitely try this to culminating what we have learned! This is a great project. I am excited to start with my students. Do you have the cover letter assignment sheet? I don’t want to reinvent the wheel. Thanks for your commitment to education! I’m a little confused on the graphing part. What equations are they supposed to be graphing? What did you have for axis labels? I initially graphed each equation with days on x axis and money on y axis. Going up to 31 days and up to 10,000 but my graphs don’t look like they would help with anything. Wow! This is quite comprehensive. I would love to try this out for my class this upcoming school year. All the way here in Malaybalay City, Bukidnon, Philippines. Thanks a lot for sharing. I’ll give you comments once I will use it. Thanks for trying it out! Let me know how it goes. I was just wondering do you have some kind of interesting launch/way to introduce this project? I was thinking a video of some kind would be good, but I don’t know. Suggestions? Thank you. This is a great project! I organized a similar assignment for an algebra class, but using inequalities , where students must select an amount less than or equal to a set budget. I had the students research their own prices, which was a bit too time consuming. I also like your MTV spin on the idea. My reluctant learners LOVED this project. They all can see what and why linear equations are so important to learn. I will be using this FOREVER in all my classes from 9th-12th because it is fun.